Flag | I'm not stalking you. 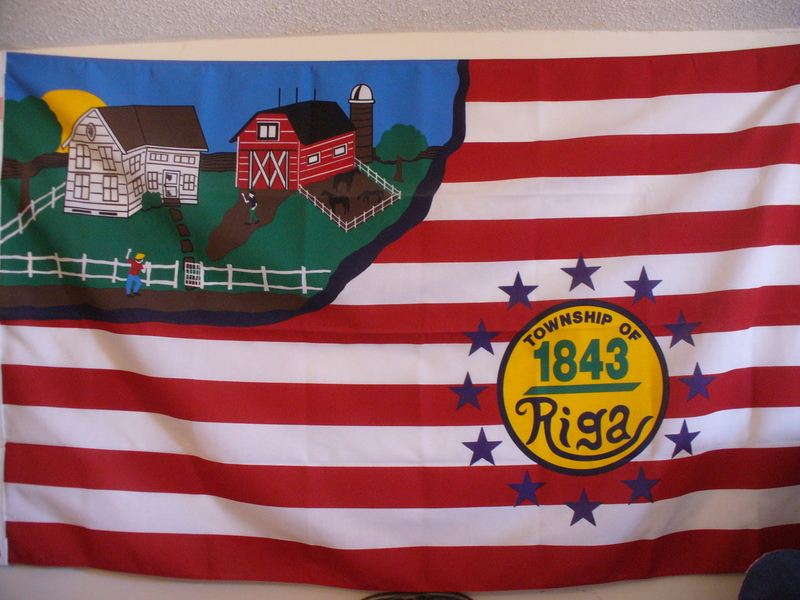 You’ve probably never heard of Riga, Michigan (population 1,439). I wouldn’t have expected you too. But that is where my Dad lived when he married my mom. She moved in to the old family farmhouse with him. 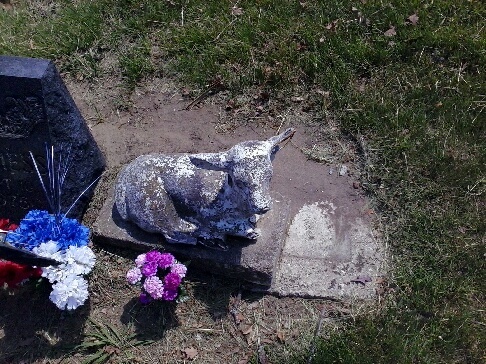 That’s where they lived when he died. That’s where she lived when I was born. And that is where I lived for the first eight years of my life. Riga is…small. There is one blinker light where Riga Hwy hits the main road, US223. No other traffic lights. Oh sure, sometimes the train comes through and the railroad flashers get stuck on, so it gives that illusion. There used to be a church for every bar in town. Then one of the two bars burned down. The post office and the bank were on the same side of the road, with only a few houses between them. As a kid, I could never remember which was which. So, in 1993, in the Blissfield Advance Newspaper, I saw an ad for a contest. 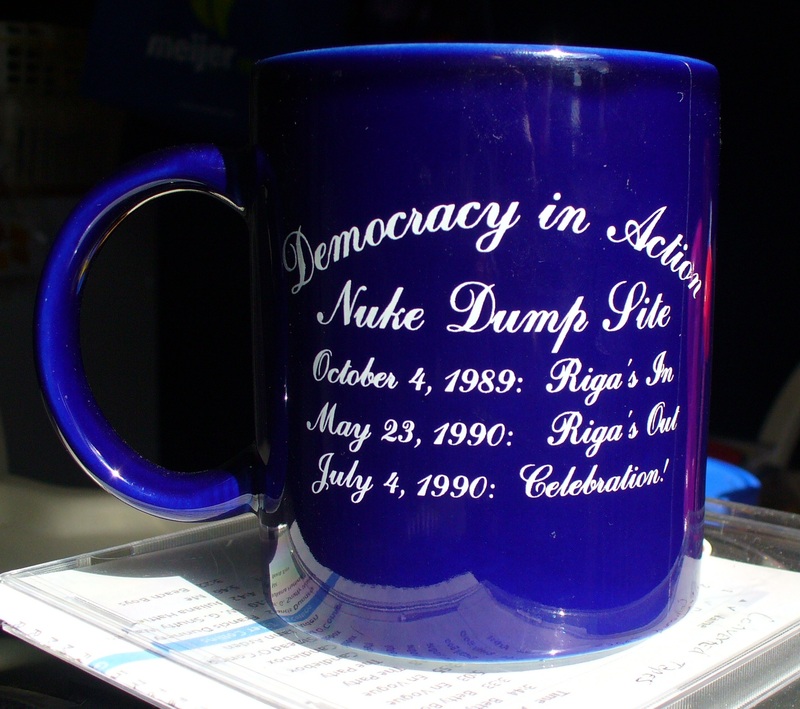 Riga was going to have a Sesquicentennial Celebration. 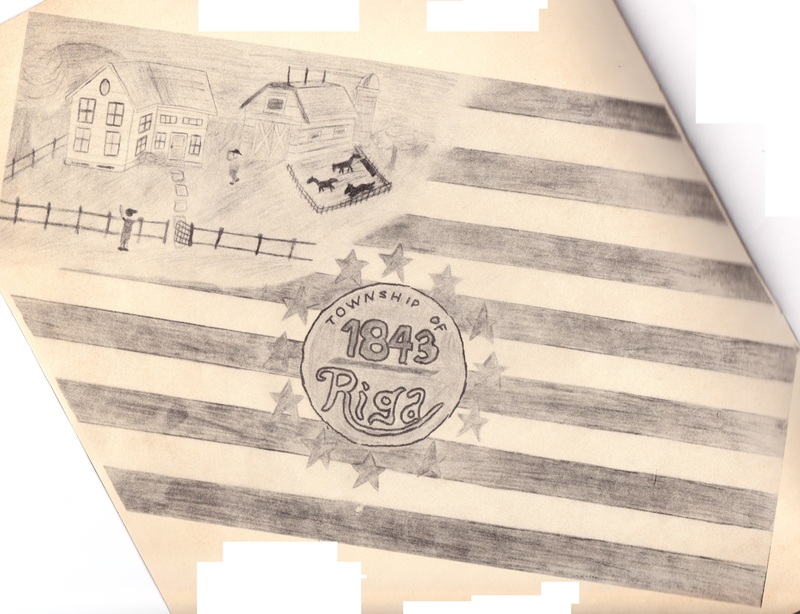 They were having a “design a Riga Township flag contest”. Something instantly clicked in me, that this was something I had to do (I have had those moments now and then throughout my life). So, I got a piece of poster board at the local pharmacy within walking distance, cut it to the required size, and chose colored pencils as my medium of choice. I did a rough draft first (which I almost NEVER do). I only did one rough draft design and that is what I used for the final design. 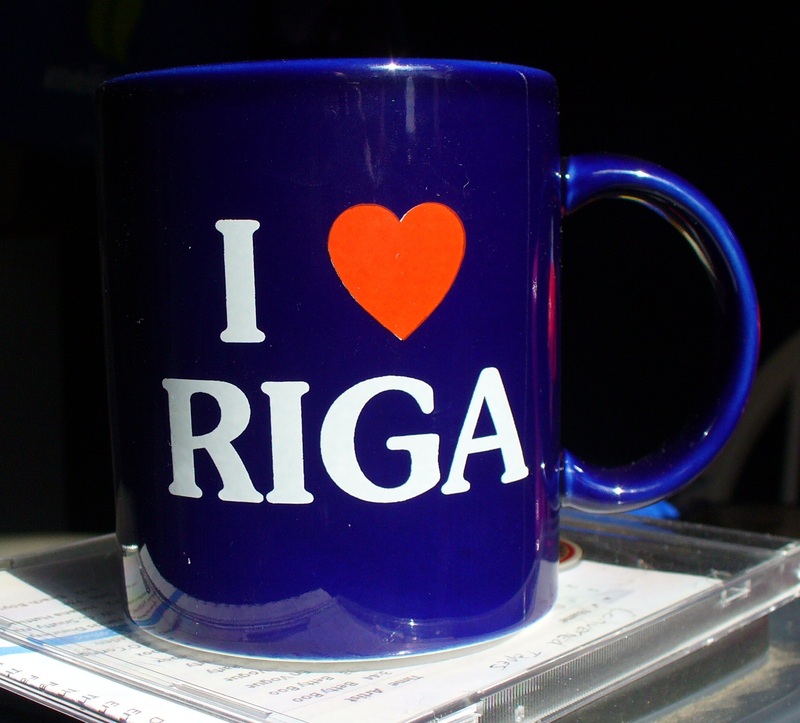 When I think of Riga, I think of farmers, barns, livestock, people waving hello. I worked all that into my design. I sort of ripped off the United States flag, replacing the field of stars with an actual field. The house on the flag slightly resembles my old house. It was required to say “1843”. I finished my masterpiece and turned it in at one of the listed locations, the bank within walking distance. I didn’t entirely trust the bank employees to turn it in to the proper authorities. And they probably all unrolled it and laughed at it. The original drawing was in color. I would have gone to the judging, but that night I had an academic awards ceremony at school. (That year I cleaned up.) So imagine how nice it was to come home and hear on the answering machine that I had won the flag design contest and the first prize of a $75 savings bond. I learned that they were going to make a physical version of my flag, but that they would cost like $50 each to purchase. Kind of steep for a seventeen year old with no job. When they gave me my savings bond at the July 4th Sesquicentennial Celebration, they gave me one of my flags for free. I found out they had other contests, like “design a postmark”. The same woman won all of those contests, but her flag came in second to mine. Somehow that made it a sweeter victory. Now my flag hangs in my guest bedroom. (And, I assume, at the Riga Municipal Building.) It might make me a giant dork, but I think it is sort of cool to have designed a township flag. Maybe generations from now the people of Riga will look at their flag and wonder about who designed it. Or maybe they will have a new contest to replace it. 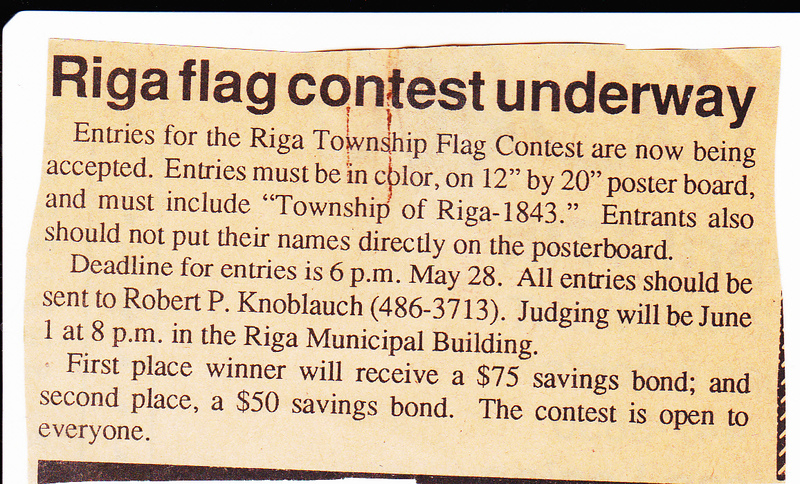 Posted in Childhood Reminiscing, UnProfessional Photography & Artwork and tagged 49276, Contest, farmers, Flag, folk art, Michigan, nuclear waste, Riga, Township. Bookmark the permalink.